The Boy prepares for a long, bone jarring journey that will tax us both - going up and down the road. “Yeah, I thought we were going to get one when you left.” Amazingly, The Mrs. has this mind reading thing going on, so the things I’m going to do in the future are as known to her as the things I’ve done. The Mrs. got dressed up in her warm boots and jacket, and The Boy got dressed up as you see two posts below. The funny thing is that particular snowmachine outfit (with the exception of the boots and facemask, but including the helmet) was one I used when I was his age, and seems little the worse for wear. I suggested The Mrs. take the first ride since the machine had gotten home. Now, in her defense, she’d never ridden a snowmachine before. The Mrs. got on and was confronted with two flippers. Depressing the one on the right causes the engine to get gas. Depressing the one on the left causes the brake to engage. Simple, but that wasn’t the problem that The Mrs. was having. Her problem was that as she depressed the gas, the snowmachine just rev’d up, but didn’t go. Just one ride will show you that you have to rev the engine up for a while until the clutch engages and you translate burning gasoline to fun. I told her to push down and hold, and she gingerly drove the machine up our road. When she came back into our yard, she did a moderately fast turn. Now, I forgot to tell The Mrs. that with a snowmachine that you’ve got to lean in to the turn, wicked hard, or else the machine flips like the top-heavy combination of fiberglass, rubber and aluminum that it is. Fortunately, she figured it out before turning over, else I would have had some ‘splainin to do. After her first ride, she pulled The Boy up and on the machine in front of her. I could see that with each pass up and down the road her speed increased just a little more, and she seemed more comfortable. If you’ve never ridden a snowmachine, I’ll do my best to explain what it’s like. When I was a kid I’d pretend that my snowmachine was some sort of advanced tactical fighter jet – the ride was so smooth, yet you could turn, speed up, slow down and maneuver to your heart’s desire as the spraying powdery snow danced up around you, jumping the occasional obstacle and for a moment being weightless in midair. Riding a snowmachine was like a dream. When we drove them as a family we’d scoot deep back into the woods, turn them off, and have a nice lunch twenty or so miles from the nearest road fit for traffic, the only sounds the slight breeze through the mountain meadow and the sounds of the metal on our machines going “ping” as they cooled. Snowmachines also led to great stories, like the time my brother was riding my machine and got it stuck. He was off the machine, attempting to get traction for the track that runs under the length of the machine. As it finally got enough traction in the powdery snow, the throttle picked that time (because of a frayed cable) to stay in the full open position, dumping all the gas that the carburetor could deliver to the engine. My brother managed to grab the back of the machine as it began to accelerate past him. The machine took off over the big meadow, my brother being dragged behind like a limp doll, bouncing up and down off the snow. Finally, he could hold on no longer. He let go, and the machine (a 1975 Arctic Cat Panther) instantly accelerated, as it was not longer burdened by the need to drag and smash my brother across the snow. My snowmachine must have been going near 100MPH when it hit the trees. Even though my brother had just (and this wasn’t his fault) smashed my snowmachine, I wasn’t in the least upset, because even though that machine was sold over a decade ago, I still have the memory of him hanging on to the driverless snowmachine speeding across a snowy mountain meadow. Heck, I wasn’t mad when it happened. It was just too friggin’ cool watching all that. As I watched The Mrs., these memories came flooding back to me. The freedom and joy of being one with the machine, plus the goofy stories that The Boys would carry to their family. I was fairly sure The Mrs. would like it, but still that doubt remained . . . I saw her helmet bob in affirmation. I also learned to not let him touch the accelerator. When we were stopped, I encouraged him to depress the gas. At first he was tentative. Then he rammed the flipper down to the handle, leaving me barely hanging on as I scrabbled to remove his mittened fist from introducing enough liquid energy into the engine to drive us into the trees ahead. Fortunately, I was able to do so. Point and match, The Mrs. She’ll get a new helmet, after all, if you’re riding, you need one. We went shopping yesterday. The baby food aisle is next to the magazine rack. As The Mrs. and I were dumping gallon after gallon of baby food into the cart to satisfy the voracious appetite of The New Boy, I heard a small voice behind me. “What magazine?” I asked, not even turning back to look. Yeah, you can get that one. I think we’ll be needing another machine some day . . .
maybe soon, if I can find one that won't reduce me to hundredairedom. Sheesh. No snowmachine will ever match the personalities of 20 sled dogs. They'll ping for you if you want. 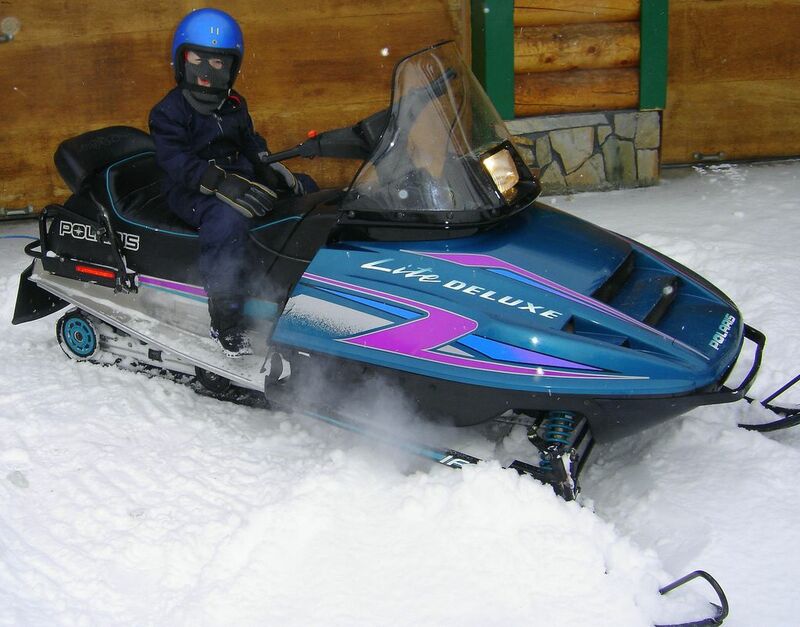 I think I would definitely prefer snowmachining to a jetski. I HATE water. You did such a good job talking about snow machines that I want one now, and we don't even have snow. Go ahead, get another one. How about the New Artic Cat Jaguar Z1. It would be perfect for you. After, even in hundredairdom, you are still making 5 figures. Ahh, the children of the night, listen how they *ping*. Thank you! I think you would enjoy it fine - you just have to dress warmly. We've got 'em for sale up here . . . even saw one with NASCAR logos (but it was Tony Stewart). Heh hehe. One day . . . one day I'll have to talk a 16 year old into not getting one . . .